Asian stocks in New York were mostly higher Friday though the benchmark index was little changed with Japanese issues providing the single biggest drag. 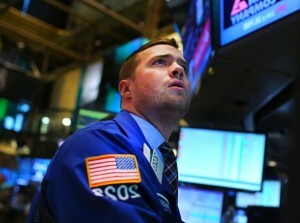 The Bank of New York Asian index of American depositary receipts was last flat at 144.49 in mid-morning trade. Suntech Power (STP), a manufacturer of photovoltaic products, was the biggest gainer rising 28% to $0.46. The9 Ltd.(NASDAQ:NCTY), a developer and operator of online games and internet related businesses, rose 13.4% to $2.80. Youku Tudou (NYSE:YOKU), an internet television company in China, gained 10.9% to $34.21. Japanese ADRs were mixed with 7 of 16 issues falling. Advantest Corp. (ATE), a manufacturer of semiconductor and component test systems, rose 2.2% to $11 while ORIX (IX), a provider of financial solutions to corporate and retail clients, slipped 1% to $73.74. UBIC (NASDAQ:UBIC) which provides computer forensics services in Japan, was the largest Japanese decliner on the day, slipping 5.1% to $4.70. With two months of the trading year concluding, the three best performing American Depositary Receipts year to date are all China-based. Kingtone Wirelessinfo Solution (NASDAQ:KONE) is up 162.8% at $7.41, ChinaCache (NASDAQ:CCIH) is up 138.5% at $21.25 and China Digital TV (NYSE:STV) is up 71.8% at $2.99. Stocks bounced off post-GDP revision lows, rallying to new record highs Friday following better-than-expected manufacturing data and improvement in consumer sentiment. The S&P 500 rose to another record high while the Nasdaq Composite pushed through its prior 13-year high. Retail stocks are once again leading the market higher for the third consecutive day, joined by shares of energy and healthcare companies. Relative valuation of stocks to bonds, liquidity, and prospects for a housing recovery that looks to boost home builders and retailers alike encourage JP Morgan strategist Thomas J. Lee. JP Morgan is also bullish on a housing recovery, and recent softness in the market is likely over-blown, as inventory for new homes remains low. Gross margins have increased to prior highs, in spite of a decline in the revenues and deliveries, thus arguing for continued operating leverage.